The Scottish vote for independence tomorrow, if successful, will have two important ramifications for Africa: one positive, one negative. The positive impact is that it could break the deadlock on global governance reform. Without Scotland, the kingdom would no longer be united, and its continued claim to a permanent seat on the United Nations Security Council (UNSC) would ring hollow. The negative is that it could lend new momentum to border changes. The possession of nuclear weapons, rather than global influence (the two generally go together) is the main criterion for membership of the UNSC. The only justification for the continued seat of France and the United Kingdom (UK) on the UNSC is therefore an expensive relic from a time when countries considered these weapons to have practical utility. Today the nuclear arsenal of France and the UK is the price paid for continued UNSC membership; and these serve as an easy bulwark against nuclear disarmament by the United States of America (USA), Russia and China. A vote for independence by the Scots would present a historical opportunity to end farce and implement real reform. Scottish independence would open the door for Germany, a much larger economy and increasingly the leader in the European Union (EU), to make the case for either a single EU seat, or for a rotational seat where members of the EU are elected (or rotate) to the UNSC for a fixed term. This will require Germany to abandon its moribund G4 initiative (a joint initiative with Brazil, India and Japan for a permanent UNSC seat, which has failed to gain traction over several years). Crippled by its antiquated composition, the UN (with the Security Council at its core) is crumbling and becomes less relevant with each passing year. Instead of being at the centre of global responses, the agenda is driven by various clubs including the Group of Seven (G7), the Group of Twenty (G20), BRICS (Brazil, Russia, India, China and South Africa) and others. None of these have the institutionalisation to give effect to their efforts, and they often serve to polarise rather than cohere. Without reform, the centre won't hold; and Scottish independence can begin to unlock this hitherto intractable problem. This will not be easy. Russia managed to cling on to the seat of the former Soviet Union after the fall of the Berlin Wall despite the diminution of its global influence. Analysts in the England are already looking to the transition from the Soviet Union to Russia in 1991-2 as an example of ‘managing the situation,’ so as to ensure the UK’s continuation of its permanent seat should the Scottish vote yes. 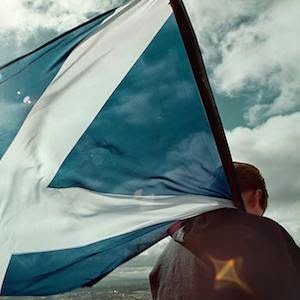 But should Scotland leave the union, Wales would eventually follow, England would have to reposition many of its nuclear weapons and its global voice would become faint and distant, reflecting a smaller economy and limited military that even the most adept English diplomacy could not conceal. The last vestiges of the once-mighty British Empire would cease to exist, and the world would be presented with a historical opportunity to reclaim the UN to the benefit of a much larger community of nations – rather than the victors of the Second World War. Ironically, it is the West (the US in particular) that would benefit most from the opportunity to embed a rules-based system, rather than clinging to a past system of privilege. The negative impact of Scottish independence is that it would provide further stimulus to a global resurgence of sub-state nationalism, with potentially disturbing and destabilising implications for Africa. The Central African Republic and Mali are already dividing along religious and ethnic lines, while Libya has effectively been split between a number of competing and overlapping fiefdoms, battling each other across the length and breadth of the territory. A Scottish vote for independence would provide an important stimulus in Africa for what is already a global trend. As much as globalisation has unleashed individual empowerment owing to poverty reduction and a huge growth in the global middle class, poor governance and a sense of marginalisation from the centre are evident in many African countries, including Nigeria, Sudan, South Sudan, Kenya, Mali, Angola, Mozambique, the Democratic Republic of the Congo and Tanzania. Minorities in many of these countries will be empowered by the success of the Scots to also exercise their wish for self-determination; and eventually the right to govern their own affairs. Although it promises greater future balance and equity, rapidly emerging multipolarity is proving globally destabilising, including in Africa. Careful stewardship is required and the UN, for all its deficiencies, lies at the heart of the associated efforts. Tomorrow, the Scots will play an important role in shaping our future.